The Colorado Rockies have proven to be a team on the rise. It won’t be long until they pose a true threat in the National Leauge West and find themselves in the playoffs. The Colorado Rockies have been at the bottom of the barrel of MLB for many seasons now. It’s about time they show signs of a contender. Their record has improved each of the last three seasons, with the 2016 season ended with the Rockies only eight games under .500. Consistent subtle improvements have implanted optimism among Rockies’ Nation, however it’s the same story every year– Colorado’s offense gets better and better, but they can’t pitch. The Rockies possess one of the league’s most dominant offenses. Opposing teams fear the Colorado bats no matter where they’re playing. They led the National League in runs scored, home runs, and batting average in 2016. 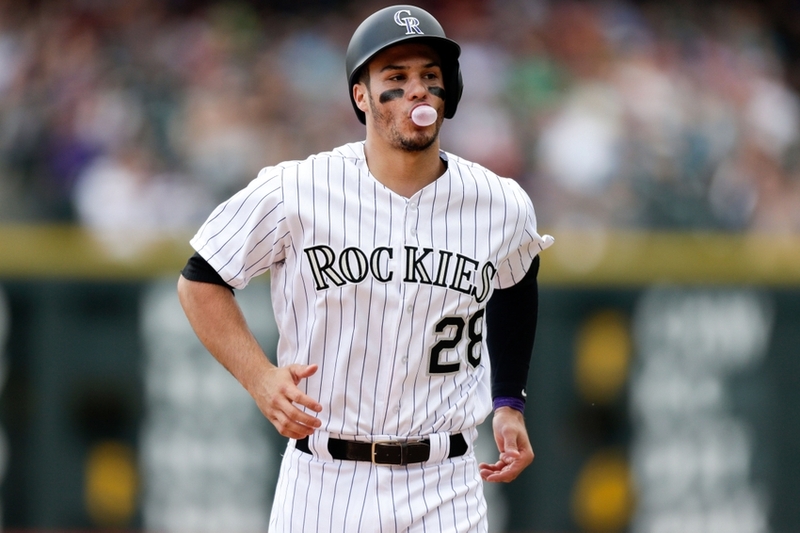 Annual MVP candidate Nolan Arenado sets the tone for the offense. He has plenty of help from slugger Carlos Gonzalez, rookie sensations David Dahl and Trevor Story, and NL batting champ D.J. LeMahieu. No elaboration is needed, their offense is elite. Pitching is the consistent issue for the Colorado Rockies. In many ways their home ballpark of Coors Field is the demise of the Colorado pitching staff. Not only are their current pitchers forced to take the mound of the most skewered hitter’s ballpark in baseball, but their ballpark also spooks any outsider from coming to Colorado to pitch. For this reason the team has had to develop their pitching talent from within. Colorado’s 2013 first round draft pick, Jon Gray, showed great promise last season. He worked 168 innings and struck out 185 batters in 29 appearances. Gray is expected to be a mainstay in the Colorado rotation with the hopes of becoming an eventual ace. The team also saw good efforts by Tyler Anderson and Chad Bettis. Anderson, a crafty left-hander, managed a 3.54 ERA in 2016; Bettis finished in the top 15 in MLB in ground ball to fly ball percentage rate, a prized statistic for a Colorado pitcher. Yearly improvements by each pitcher are imperative if this team wants to soon contend. It would not be the worst idea for the Rockies to forfeit some of their top minor league talent for a true ace. Perhaps not in 2017, but a move needs to be made if they want to make a legitimate run at the playoffs in 2018 or 2019. Colorado’s top two prospects are shortstop Brendan Rodgers and third baseman Ryan McMahon. Each are sensational prospects, and therefore could return great value if the Rockies opt to trade them. Although it is tough to give up such highly touted prospects, the team’s current infield is pretty well set for the future. Arenado won’t allow any room for McMahon at third base. If Trevor Story‘s sophomore season is anything like his freshman season, he will earn the shortstop role for years to come. This makes the top prospects tradeable. It’s too early to predict the trade market in 2019, but that is the invisible deadline for Colorado to bring in an ace. Ubaldo Jimenez had the last memorable season for a Rockies pitcher, and that was six years ago. The trend of average or below average pitching must come to an end if the team wants to be taken seriously. A firstbase addition needs to be made to round out the supremely talented Colorado infield. Now’s the time to do it. The free agent market is loaded with first basemen. Edwin Encarnacion heads the market, but Mike Napoli, Mitch Moreland, Adam Lind, and Brandon Moss are also available. No need to swing for the fences and attempt to sign Encarnacion. The competition for the 33-year-old is overbearing. The Rockies should make attempts for Mitch Moreland or Mike Napoli. Each are known for their power, and Coors Field is the place to welcome such a powerful asset for a reasonable price. Good luck stopping that lineup on a daily basis. The dawn is near for the Colorado Rockies. Their offense is playoff-ready, it’s just a matter of adding the right pieces to the pitching staff. The Colorado Rockies have a young core with a lot of swagger. Their confident bunch won’t have the patience to end many more seasons after just 162 games. The goal is likely one year premature, but the playoff topic might just be realistic come 2018.